With the taxes more closely integrated, is there still an advantage for the dividend strategy since it doesn't require payments for things like the CPP? I cannot provide a definitive answer. The dividend strategy involves paying dividends and saving more in your corporation, so the answer is multi-layered. Jamie showed in his 2011 paper that there is a definite benefit to using the dividend strategy to build your own corporate RRSP. However, I am not sure how much this benefit has been affected by the dividend change, but you will not have a RRSP or CPP benefits under this strategy. the tax credit to the employee, which mitigates the cost of both the employer’s and employee’s contributions. Informal discussions with several actuaries more realistically estimated internal rate of return for present CPP contributors to be around 3%. So the answer is yes and no and depends on several factors and preferences. I am sure not the clear answer you wanted. Hi Mark, I think I understand... maybe :) It sounds like you're confirming what I thought, that the taxes are pretty much identical either way but other charges are not equal since they apply only to a salary. So if I take those savings and invest them at a rate of return better than 3% (I calculated about the same rate myself) then I'm better off than someone who gets CPP benefits. That's it pretty much. But again, some people do not wish to give up their RRSP or CPP which you do if you only take dividends. With a "dividend only" strategy, what do you suggest if the business income is above the small business limit? Should you "bonus down" ? I do not provide specific tax planning advice on this blog. The general consensus in the profession, which may or may not be my opinion, is if you plan to leave the money in your corp a over say 5 years, you should not bonus down. Have an one year old company started in Jan 2013, Jan-Dec is financial period. 1. Can I take dividend before the tax is paid from corporation at year end ? If you have withdrawn monies during the year, it is fairly standard practice to reflect those draws as dividends by having your accountant make an adjusting entry at the Dec 31, 2013 year end reflecting such. 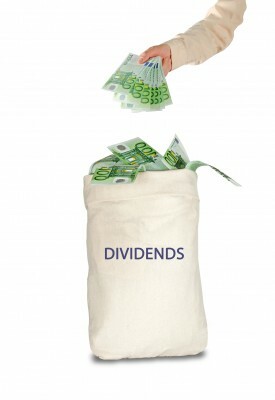 Those dividends are then reflected on a T5 that must be issued by Feb 28, 2014. I don't fully understand your question about taking dividends before paying tax. However, you can pay dividends or reflect them paid before you pay your corporate tax. Jeepers. This is stuff I always leave to my accountant. Looks like I better have a chat with him. I think he pays us mostly dividends, because it's more income. The tradeoff is, no RRSP room (which is another matter entirely, does a small business owner contribute, or are they better off funneling money back into the business). If there's no pro's to dividends, and one is pulling all their income out, then dividends are actually a disadvantage because you lose the RRSP room. I think you should sit down with your accountant and discuss his planning for you. I would guess you receive only dividends because you are trying to build up your "own RRSP" in your company. Even though you rely on your accountant you should understand why he is telling you to take dividends and ensure you are on the same page. I was operating an IT consulting firm until 2012 and received dividends. I have recently received an Requirement to Pay notice for corporate taxes that are still owed. It was sent to the corporation but the agent is telling me that I will be personally liable as director since I was not entitled to dividends if there was a tax balance. Hello... my wife and I recently started up a small business which we incorporated right away. To date, there has been no income and only a few small expenses. After some re-consideration, we have decided that we would like to convert to a Partnership (located in Ontario). I believe that this is possible but am not clear on a few things... Do we need to file a tax return for the Corporation, or can all of the expenses to date just be rolled in to the Parternship and reported at year end? Same question with the HST paid? How is this process initiated? Will I need a new HST and Business Number? Thanks very much! If I understand correctly, as of 2014 using the dividend strategy for the most part only produces a tax deferral benefit. Just so I am clear- if I draw from my Corp through the year (year end is Jan 31), a T5 would be issued for the period up to Dec 31 and then tax due end of April? Yes, all dividends paid in a calender year are included on that years T5 and tax is due by the end of April. However, you will likely have to make quarterly tax installments after the first year of paying dividends and thus, the tax will be paid throughout the year. Hope you're still answering questions on this post. My accountant has shown me calculations showing me that splitting my business draws equally between my wife and I as dividends saves a lot of taxes vs. claiming a single salary for myself. My wife has no other income. Is this possibly one of the situations where dividends still yield overall tax benefit when considered for an entire family? Hi I hope you're still answering questions. I've been incorporated for 8 years but recently my corporate activity has decreased. The flip side of that though is that over the years, I've accumulated a deferred balance. In other words, I took dividends but deferred any amounts that were paid out above a certain "bracket" for future payment. Now that I'm a fulltime employee, I have limited time to spend working on the corporation (it was professional services corp). My question is: with reduced activity, and still having expenses, over the next few years, can I just pay back into the business what was previously deferred as income?